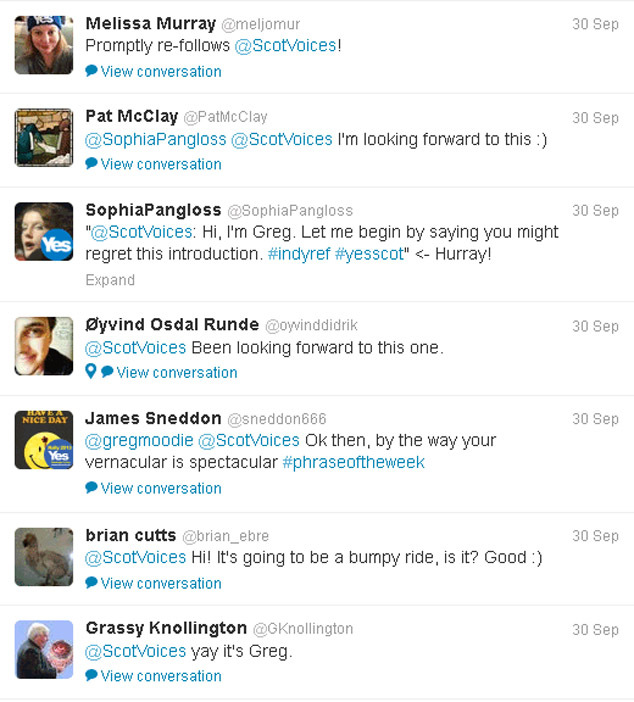 Last week, I was asked to curate @ScotVoices, the rotating Twitter account featuring a different Scot each week. I was delighted to be asked, although it was probably naïvety on their part. They gave me a set of guidelines. I didn't read them. 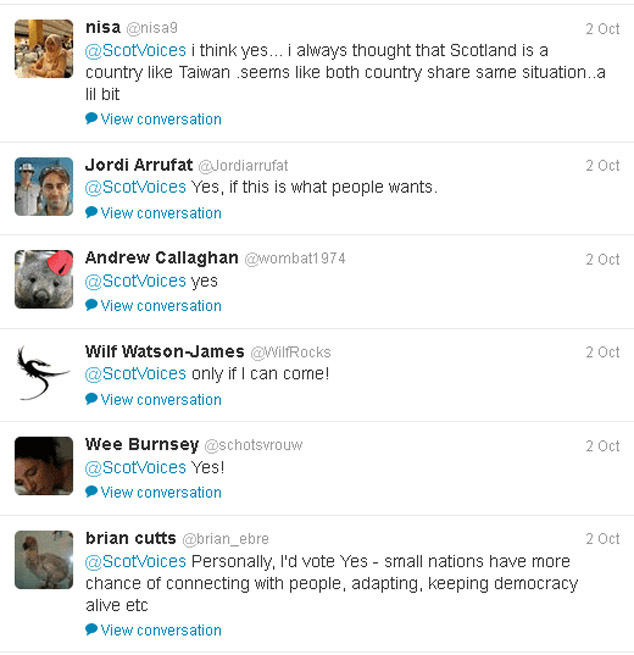 They said people follow the account to find out about Scotland. I told them I was used to having huge amounts of fun at the expense of others and was ideal ambassador material. They let me wade right in. I thought it was only fair to offer some sort of mini-disclaimer in case there were timid souls amongst the ScotVoices crowd. By the time I made it over to the interactions tab there were already a few welcoming words. And this query from noted Scotsman columnist/problem, Euan McColm. Which was dealt with promptly. 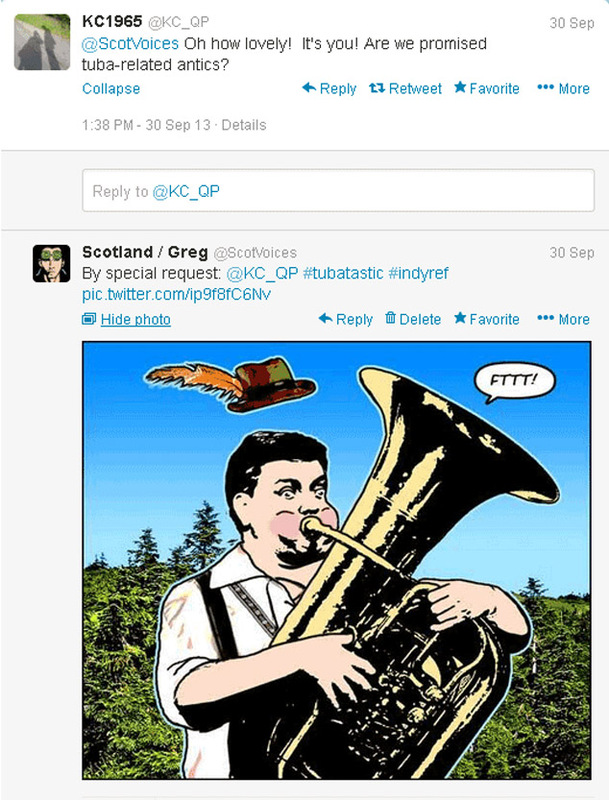 I explained that I was the man who tried to sell a fleet of Trident nuclear submarines on Ebay, that I’d set up Regional Collective: Artists and Creatives Against Independence on behalf of Alistair Darling, and was now best known for National Collective’s Sunday Cartoons, of which this was the latest. After more prodding by The Scotsman’s McColm, it occurred to me that certain elements of the press might love nothing better than a ‘National Collective Guy Loses Temper, Says Something Regrettable on ScotVoices’ story. But that was never likely. Having spent Day One upsetting No campaigners, confusing Americans and alarming National Collective, I tried to avoid politics. That lasted about ten minutes. I didn't sign up to Twitter to talk about basket-weaving. Much conversation ensued. The general consensus was that pandas were vastly preferable to princes, and I got the distinct impression that the ScotVoices crowd considered our royal family to be a bunch of expensive duds. 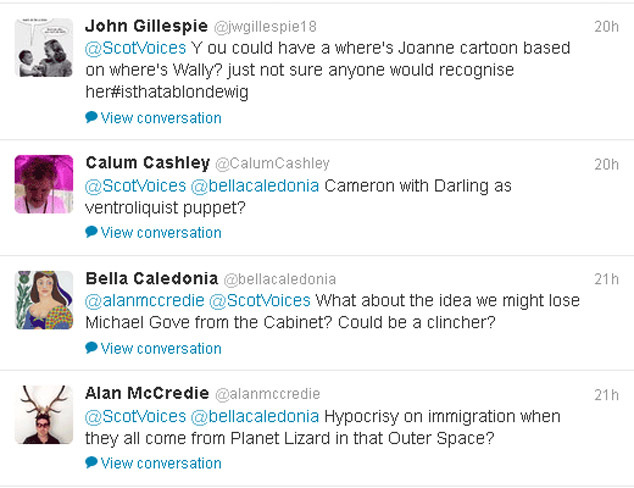 Today there were voices expressing concern at my ‘politicising’ ScotVoices. I believe the expectation was that, being part of National Collective, I should be discussing wish trees, knitting & Icelandic goatherding. I thought about trying to placate them, then decided against it. Well, let me tell you, the account went like a steamtrain for the rest of the day and I pretty much sat back and let them get on with it. I said The Scotsman would tend to agree with her - their editorials generally announce 'Scottish Independence: What's The Point?' every day of the week. 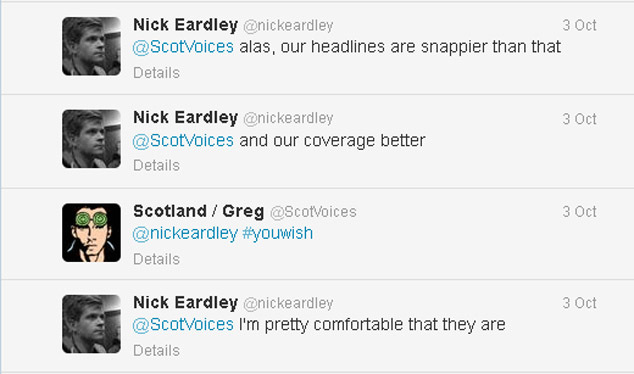 Surprisingly, on hearing this, up popped The Scotsman’s assistant editor, Nick Eardley. At this point in the week I am generally wondering what to draw for the Sunday Cartoon. As Rose Garnett wasn’t around, I dressed up my bone-idleness as a ‘collaborative group project’ and asked the ScotVoices crowd for ideas. Initially it was slim pickings, with the only possibility being 'Daily Mail editor Paul Dacre riding a dinosaur with naked lassies on a rocket ship blasting into Ed Miliband's bum' (@Masterwiggins). However, I had to turn this down as nobody has ever seen Paul Dacre. This had a galvanising effect and the suggestions came thick and fast. It reminded me that there’s nothing like abuse for getting things done. My weekend, on the other hand, was likely to involve more tiresome Bacchanalian feasting and the occasional raising of my weary head from the bosom of some maiden to draw speech bubbles. I spent the rest of the day doing everything I could to avoid the issue. I complained that I didn’t really want to be a cartoonist and my current situation was entirely the fault of Scotland On Sunday’s Kenny Farquharson. At which point, in stepped the man himself. This of course was all displacement activity. Eventually, I was rumbled. 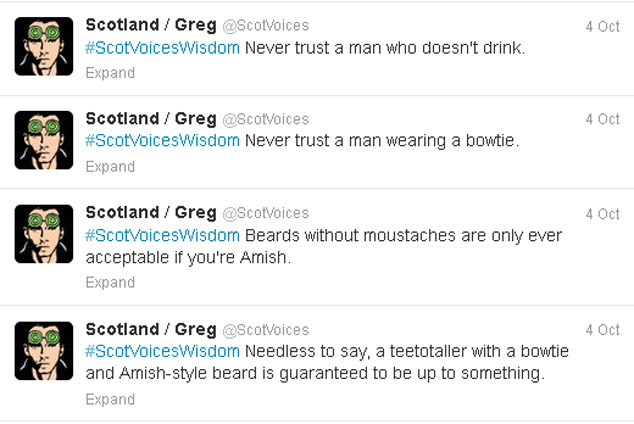 I wasted even more time with a #ScotVoicesWisdom thread, hoping something would come up. 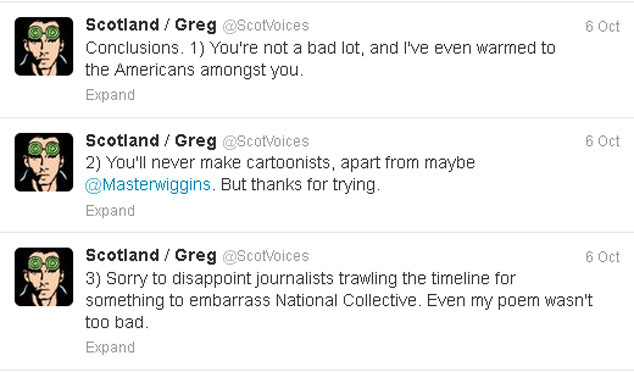 But ScotVoices readers were not fooled. This was ‘bawbaggery of the highest order’ (@johnferguson88). Mercifully, at this point Rose Garnett arrived and poured a sherry-like substance into two glasses. “Tory party conference,” I replied. She shot me a glance so icy that I thought I might turn to stone. A painful ten minutes passed while she got to grips with the details. You can see the finished piece here. 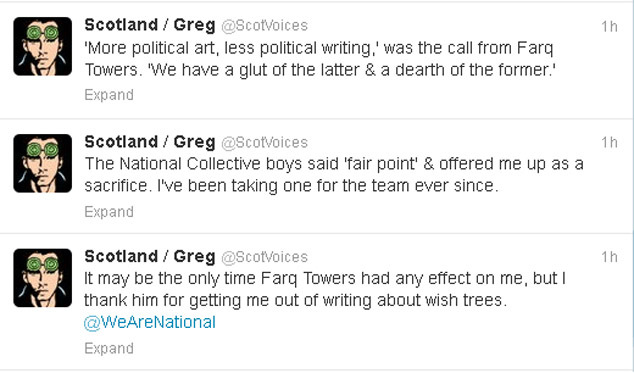 So what had I learnt from my week’s incarceration at ScotVoices Tower? 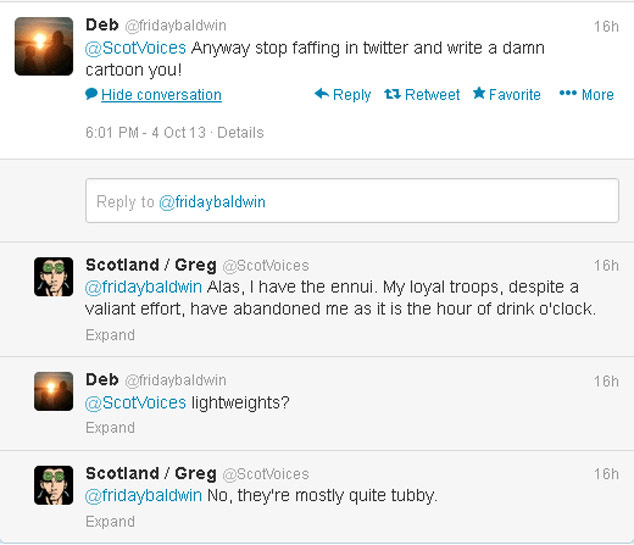 As if to confirm that this was indeed the case, The Scotsman's McColm reappeared. But nobody paid him any attention. I was on a roll. 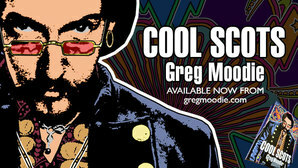 For more abuse & information on all-body home-perming kits, follow me @gregmoodie. 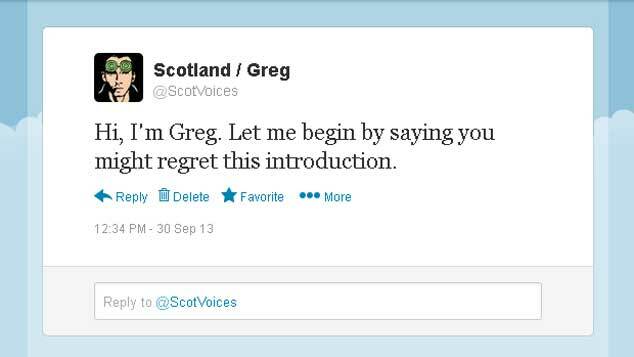 Last week, I was asked to curate @ScotVoices, the rotating Twitter account featuring a different Scot each week. I was delighted to be asked, although it was probably naïvety on their part.